Please join Borneo Tom, author of the travel journal, as he virtually tours the blogosphere from March 2011 to February 2012 on his first tour with Pump Up Your Book~!! Science teacher Tom McLaughlin battled a rare neurological disease to a stand still, packed up his life and moved to Malaysian Borneo from a Washington D.C. suburb. Landing in Kuching, he quickly learned the Malay language and involved himself in projects which includes orangutan rehabilitation and research about the famed naturalist, Alfred Wallace, whose thunder was stolen by Charles Darwin. The advent of cheap air travel to many destinations in Southeast Asia transported him to many adventures. From dancing naked in an earthquake in Sumatra, to getting lost in a warren of World War II Japanese caves to walking the rim of a volcano with poisonous gas, he has jumped with foolhardiness into everything wild and wonderful, all related in his book Borneo Tom. Reuniting with his Peace Corps family of thirty five years ago, sharing adventures with one daughter, then reconciling with another after a divorce, marriage with full kampung ceremony and then taking both daughters on his honeymoon to Bali are a few of the highlights of his remarkable personal life. Oh, but we can’t forget? His vasectomy coupled with a wife diagnosed as barren has reproduced a son, Dzul Patrick, now a few months old. 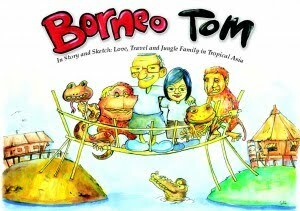 Tom teaches at the Lodge International School in Kuching, Malaysian Borneo while writing about his adventures as a US expat living in Borneo. Join award winning science teacher Tom McLaughlin as he moves from America to Malaysian Borneo as he tracks orangutans, dances naked in an earthquake, swims with jellyfish AND MORE DANGEROUSLY…falls in love. Walk with him through a cacophony of emotions including great joy when he finds the love of his life and marries in a village ceremony, reunites with one daughter after a divorce, travels with another and flies the entire family on his honeymoon in Bali. Oh, yes, did I forget? His vasectomy and his wife’s diagnosis of barrenness produces a son, Dzul Patrick, now a few months old. 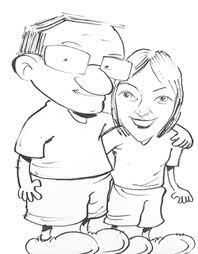 Each stand alone chapter is humorously sketched by Water Front Niki, a familiar face to all who visit Kuching. Niki’s sensitive portraits of the national bird, the Hornbill, decorates living rooms world wide. I am a new follower. Love your blog and can't wait to read more! Please visit my blog and return the favor if interested. Thanks!